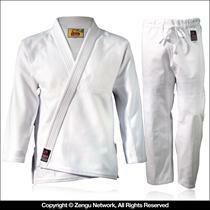 Children's jujitsu gi with strategically placed reinforcements for comfortable and reliable use. A true BJJ cut, that's designed to withstand the rigors of training, at an affordable price. The is an excellent value in a chidrens' gi. Fuji is a trusted brand that has been a proven performer for over 50 years. For durability and price, they're hard to beat. Email your friend about the Children's Brazilian Jiu Jitsu Gi. Ask a question about the Children's Brazilian Jiu Jitsu Gi.